At what point is getting by with meager growth, chronic unemployment, and negligible deficit reduction not acceptable anymore? Democrats are lauding the recent Congressional Budget Office (CBO) report which shows the federal deficit has shrunk from last year’s level of $483 billion to $468 billion for the current fiscal year. It’s a sad commentary on the current state of the country when the administration is bragging about a deficit of almost half a trillion dollars six years into its eight year reign. While it’s true, the deficit has gone down very slightly, this report is not the economic success story the liberal media is making it out to be. It has been widely reported that the deficit is only going down because of fuzzy math and dishonest reporting of Obamacare costs but even if we take the CBO at its word there are several problems with this report. The deficit did appear to go down, mainly because of the expiration of Obama’s trillion dollar stimulus. The report also shows that the deficit has dropped slightly from last year and is expected to drop in 2016 and hold it’s position until 2017. Good news right? Kind of. If these decreases existed in a vacuum, they would be great news. The problem is that in 2017, coincidentally the year Obama leaves office, the deficit is projected to take off again. This increase will be primarily due to surging Obamacare costs that were structured in a way to not take full effect until Obama leaves office. One of the most notable costs, health care exchange spending, will grow from $15 billion to $100 billion by the time the president leaves office. Also, over the next ten years, medicaid expansion and health insurance subsidies will skyrocket by almost two trillion dollars. The administration has no plans to combine the modest deficit decrease with responsible spending. When asked if Obama’s 2015 budget would include spending increases, White House Press Secretary Josh Earnest said earlier this month, “The President has been pretty clear about the fact over the last two weeks that now is exactly the right time for us start making some policy decisions that will invest in middle class families.” Translation: Yes. Not only are deficits expected to rise when Obama leaves office, now his administration is pushing to blow through spending caps and hinting at more spending programs. How does that jive with his “fiscally responsible” image? If lowering spending was a real concern it would make sense that spending caps would stay in place, maybe even be lowered, in order to chip away at the enormous amount of federal debt. It is becoming clear that this manufactured deficit reduction is simply a ploy to gain public support for more spending and the delays in Obamacare expansion are meant to either assist the next Democrat president during the 2016 campaign or cause problems for a potential Republican president when he or she takes office. The CBO report also lowered it’s expectations regarding the growth of American economic output over the next ten years. It is now anticipated that over the next decade, the economy will grow at a 1% lower rate than previously anticipated. The economy is also expected to grow at a slower rate over the next 4 years than earlier projections indicated. The media is also failing to mention the exploding federal debt situation that has increased under Obama more than every president from Washington through Clinton, combined. That debt, is expected to represent almost 80% of GDP by the year 2025. 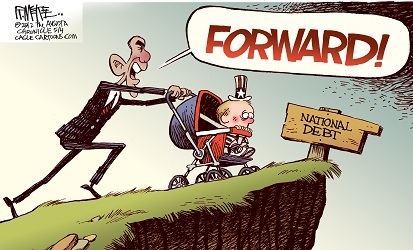 By the time Obama leaves office, the national debt will be closing in on 20 trillion dollars. That number is simply unsustainable for a healthy economy. Any claims that the Democrats are looking out for the long term financial future of this country are simply impossible to support. This anemic economic recovery that has taken six years to create is not trending upward by any honest economic standard. More people are out of the work force than ever before, more people are on food stamps than ever before, middle class incomes have stagnated, the list goes on and on. This recent CBO report contained a lot more negative information than it did positive and sooner or later the media will have to ask themselves the question: At what point is getting by with meager growth, chronic unemployment, and negligible deficit reduction not acceptable anymore? Next Next post: Bill Maher Doesn’t Think America Needs A Navy. Seriously. Reblogged this on i'm holding on to a fairytale. . The Federal Reserve is a giant Ponzi game that yields humongous profit for select Wall Street financiers (Primary Dealers). In the United States, all profit of the Fed legally belongs to the government. If the people found out, they would probably revolt—as has happened in previous societies. The Ponzi scheme, which depends upon increased National Debt to continue, is inherently destined for self-destruction when the public realizes that buying more debt is a poor investment and they refuse to buy the Treasury securities that return less interest than the rate of inflation. “How does the Federal Reserve steal billions daily from the U.S. government ?” you may ask. Let me make it simple. The FRBNY has exclusive control of the $8-10 trillion annually received from the auctions of Treasury securities. Ref. 31 CFR 375.3. Approximately one trillion is to fund deficit government spending. The rest is to roll over prior debt which is perpetual; mathematically, the national debt can never be paid off. The accounts are client accounts–not operating accounts. There are no reports or audits of the accounts given to Congress or the public. The profit of the Fed, derived from deficit spending securities, legally belongs to the government. Concealing and taking what belongs to the government is embezzling. Ref. http://www.scribd.com/doc/48194264/rip-off-by-the-Federal-Reserve-revised.